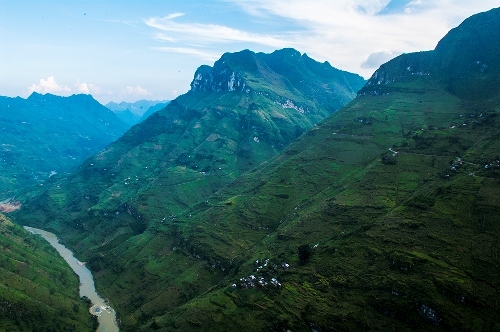 In this autumn, besides Hanoi, Sapa, Ha Giang is a must-visit destination in Vietnam. 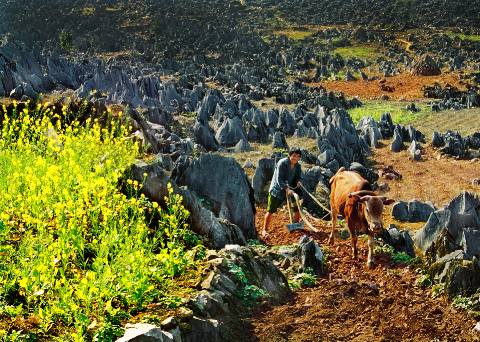 With blossom buckwheat fields, imposing mountainous landscapes and unique lifestyle and culture of ethnic minorities, visiting Ha Giang will be a very interesting trip. Here are some tips for 3-days trip to Ha Giang. 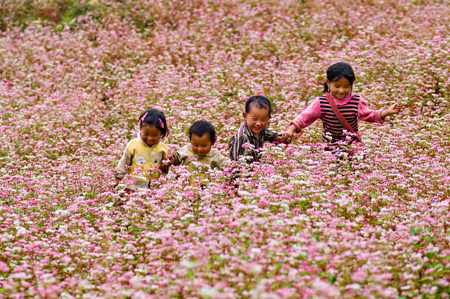 The ideal time to visit Ha Giang is from September to December, when the buckwheat fields are in blooming season. Your trip should be last for 3 to 4 days. From Hanoi Capital, you can travel by couch or motorbike to Ha Giang. A lot of backpackers ride motorbike to travel from Hanoi to Ha Giang. Others take the couch to Ha Giang City and then hire motorbike to travel around the province. Day 1: start your journey at the morning from Hanoi. You will arrive at Ha Giang city in the late afternoon. You can keep going to Quan Ba (40km from the city) or Yen Minh or stay at the city to rest after a long journey. You can walk around the city in the evening and then come back to hotel for sleeping. Day 2: after having breakfast at Ha Giang City. You can hire motorbike or take bus to go to Quan Ba or Yen Minh to arrive at Dong Van Plateau. On the way to Dong Van, you can stop at Pho Bang town to visit ancient houses with very unique architecture. On the way to Pho Bang, you will have chance to see a rose valley and a large buckwheat field on the road side (about 500m from the town). After Pho Bang, the next destination is Sung La Valley, featured by colorful buckwheat fields and peaceful village with pear tree lines and beautiful pine trees. The next destination where you can see amazing buckwheat fields is Sa Phin. At Sa Phin, you can also visit the masion of Vuong family (also call the King of Meo ethnic people). It is a very stunning and big ancient palace built by ethnic minority. From Sa Phin, you travel to Lung Cu Flagpole, the place to mark the extreme North of Vietnam. This place may mean nothing to foreign visitors, but has a very important meaning to domestic travelers. Besides, Lung Cu has super large buckwheat fields located on the mountainside. After that, you can keep going to Dong Van Plateau and stay over night in here. Day 3:In the next morning, you will visit famous destinations in this imposing rock plateau such as Ma Pi Leng Pass, MeoVac, Dong Van Old Quarter, KhauVai Love Market, ancient rock stretch, etc. If you want to experience the culture and life of local ethnic minority community, you should stay longer and choose homestay service. Foods: Ha Giang has a lot of specialties such as 5-colors-sticky rice, Thang Co, smocked beef and buffalo meat, grilled foods, corn wine, etc. Accommodation: there are a lot of hotels and motels in Ha Giang City, Quan Ba, Yen Minh, Dong Van. You can choose to stay at local people’s house to save your expense. There is rarely expensive resort in here. You should book the room in advanced to assure that you have already your room before traveling.